Back in ancient Egypt, they were worshipped as sacred guardians of the afterlife. It turns out they have not forgotten this. Today cats expect to be worshipped still, and all of us seem to be obliging them. We’re even giving them their own conventions, which is likely to have the effect of giving future cats, even more of a reason to feel like they are owed the spotlight. Where Did Cat-fluence Come From? Today there are often crazy, but sometimes not so nice, viral cat sensations like videoing your cat being scared by a cucumber. No one seems to know why cats are so afraid of cucumbers but the trick gets them every time. 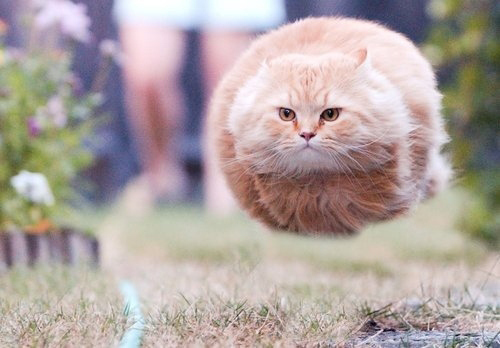 Also thanks to the Internet there has been a new sensation – famous cats. There are people whose job it is to run social media account and schedule public appearances for famous cats. Grumpy Cat is a perfect example of this – he raked in $20k in YouTube advertising in 2014 alone. Master of Boxes Maru is making way more than that, even. His YouTube advertising earnings have raked in six figures and he even has his own coffee table book. Cats have become such a big deal that there are now annual “CatCon” conventions. At these places, you can often buy cat merchandise, learn about the latest in cat gadgets, and even raise money to support animal shelters and other animal-related causes. Tens of thousands of people attend CatCon every year and it just keeps on growing. The event has even been covered by major media, from The New York Times to Vanity Fair to BuzzFeed. Cats don’t tend to show emotion like dogs do, so it’s easier to assign human characteristics to them. Often those human characteristics are aloofness, which seems to drive people completely crazy. The rallying cry of “if I fit I sit” has led to many a viral Internet video. Cats also tend to ignore video cameras, so you can often catch them in the act of doing crazy things and they don’t really care that you are recording them while they do it. At the end of the day, there is no better way to kill time or bring a smile to your face than to watch a bunch of silly cat videos. That’s why cats on the Internet are so great – they bring a smile to our faces. Learn more about the Internet of Cats from this infographic!